Today our #eminbus was parked at Saint Clara Church, right in the centre of Stockholm. It was clear it was a familiar contact point for people experiencing poverty and exclusion in the city. Music at the bus was provided by Lasse Wikstrand who writes and sings songs about his experience of homelessness and poverty. 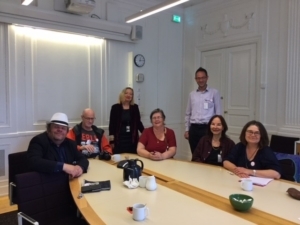 In the morning a delegation from the bus met in the Swedish Parliament with Karin Rågsjö of the Left party and member of the social committee. 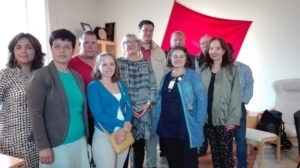 In the afternoon we met in city hall with Vice Mayor, Ann-Margarethe Livh and colleagues form the ruling parties in the city Government (Social Democrats, Left and Geens). It was an opportunity to present the work of EMIN and to call for follow up of the European Pillar of Social Rights (signed in Gothenburg last November), including the need for cooperation at EU level to create a common framework for delivering adequate minimum income schemes across Europe. Our colleagues from EAPN Sweden stressed the problems of people falling between all the different social assistance schemes and the negative impact of unrealistic conditionality that makes access of the schemes so difficult. There was also exchanges on the importance of affordable and accessible services, including housing. A message that prevention is more effective than cure and that to force people deep into poverty before they get assistance makes no ethical or economic sense. In general, there was a sensitive response from the politicians, with recognition of the need to reverse some recent developments which undermine basic principles of the Nordic Welfare model. There was a strong defence of the need for public housing that is attractive for all strata of society and the need for the ‘housing first approach’ to meet the needs of people who have fallen into deeper poverty and homelessness. Later we had a guided tour of the impressive city hall so well-known from Nobel prize ceremonies. A big thanks to Rolf, Gunvi and all the volunteers from EAPN Sweden.